Oh my goodness! Where does the time go? I can't believe that summer is halfway over! Our grandsons will be starting kindergarten and 3rd grade in a month. We have had a busy time since I last posted. In late May, Tom and I went to Ireland for nearly two weeks. Our tour included both the Republic of Ireland and Northern Ireland. The scenery was beautiful, and the weather cooperated. In fact, we were told it was the nicest May they had had in over 30 years. We also found the Irish people so friendly and hospitable. I'll share a few photos in a future post. Shortly after getting home from Ireland we had a family trip to Disneyworld. A fun time was had by all. Since we've been home we've been busy enjoying cookouts, concerts in the park, and time with family and friends. I'm also busy packaging class kits for a full fall of teaching--7 classes at four events (in Madison, Wisconsin; Bath, Ohio; twice in Sturbridge, Massachusetts). 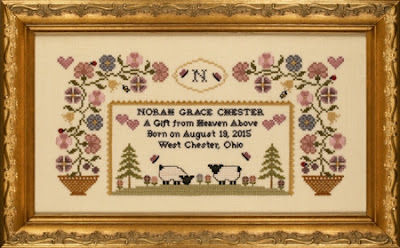 Plus at long last I have some new products--three new retail projects and two new teaching ones. Details are on my website www.withmyneedle.com. The charts have already been shipped to the shops on my automatic program. (Those shops on listed on the shop page of my website.) The charts will be shipped to my distributors in a few weeks. I hope you like the new designs. 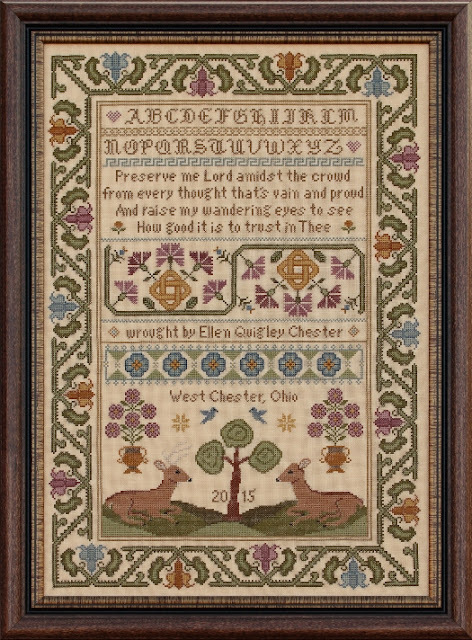 First is Amidst the Crowd, a sampler inspired by an antique I have in my collection. 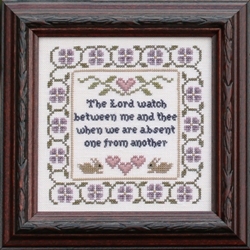 Since this sampler is mainly worked in cross stitch, it can be stitched on either linen or on aida. Next is A Gift from Heaven. The are the birth samplers I made for my granddaughters. As you can see the samplers are very similar, but I wanted them to be slightly different. Both versions are included in the package. 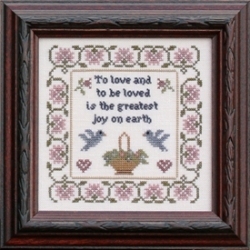 And next are two small samplers, When We Are Absent One From Another and To Love and To Be Loved. This pair of samplers are part of a new series I'm calling Sentiments. In the photos, I show the mini-samplers framed, but wouldn't they be great as small pillows or perhaps as pincushions? Next time I'll show photos of my new teaching projects. Can't wait to see some photos of Ireland. Beautiful designs! I'm still poring over Amidst The Crowd. So much detail -- so gorgeous! I need to get back to stitching. When you wrote to me saying that you were coming over to Ireland, I wrote straight back, but never heard from you. I bet you didn't receive my reply and thought I was ignoring you - I should have checked again. Hope you had a great time and hope you weren't just 2 minutes down the road from here and I missed you. 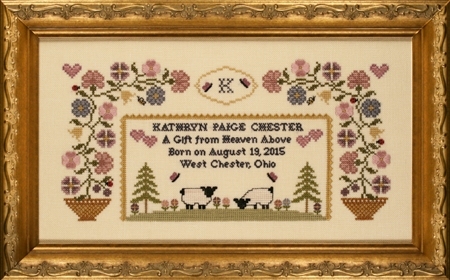 I so love your `Gift from Heaven` sampler. Must see if Sherelyn has this at her shop. Adorable. Happy Stitching.